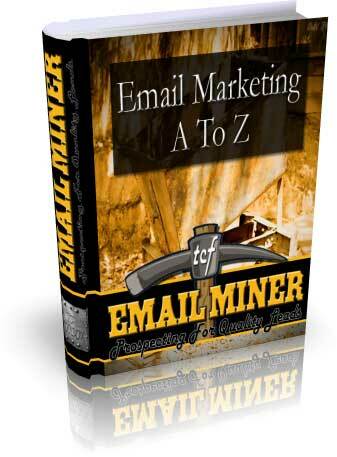 TCF Email Miner: The Ultimate Email Extractor Software! Grab Your Copy of TCF Email Miner Now! TCF Email Miner is a Unique Data Mining Software that provides you the ability to quickly generate massive Email Lists using data from all the Major Search Engines. You can target your search by keywords and location (200+ countries). Limitless Data on the Internet to Generate Leads. Short Cut Data Mining Softwares are the FAST and SMART way to Generate Email Leads quickly. "Must have" tool for your marketing toolbox! This software had blown my mind, these are verified emails and highly targeted. These guys have cracked it, this software just works and the user interface is beautiful. I would highly recommend it especially if your new to the industry and don't know how to generate your own leads yet. Even for people in the industry this is an endless supply of leads. It's definitely an amazing tool in the tool box to have. And Just Getting No Where? For most people, building an Email List from scratch can be hard but TCF Email Miner makes it easy, helping you find thousands of potential prospects you can turn into subscribers or customers. ...Its so user friendly for newbies and people of limited experience, like myself. All You need to do is type in a keyword and press start and it just takes a few seconds and hundreds and hundreds of email addresses come in a great big long list for you to save. TCF Email Miner gives you an endless supply of Email Addresses! If you want to build an email list FAST you are usually looking at spending HUNDREDS or even THOUSANDS of dollars on things like Solo Ad's to kick start your Email Marketing Campaigns. and for a low one-off cost. Want To See TCF Email Miner In Action? Watch The TCF Email Miner Demo NOW! Can you see why building an Email List can be overwhelming for most people? One of the best ways to get someones attention is to contact them via email. To quickly identify and reach your potential customers you can take advantage of data extraction "short-cut" software like TCF Email Miner, that literally makes this process SO simple and easy to do. TCF Email Miner is an incredibly fast and flexible Web Crawler and Email Scraper which runs targeted email extractions to provide you with a potential client database of targeted email addresses. The GENIUS of TCF Email Miner is that it finds Email Addresses that are already published in the public domain from people already waiting to hear from you! 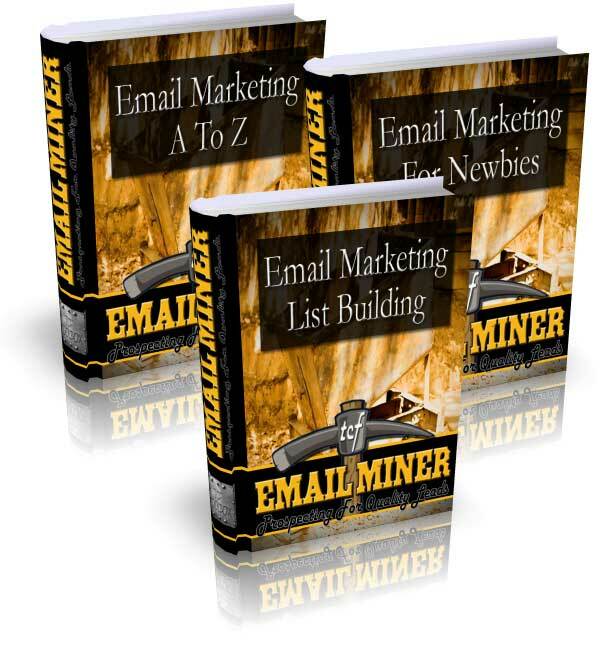 If your new to Email Marketing then TCF Email Miner also ships with lots of FREE training on Email Marketing and List Building to make sure you get the most of every email address it finds you. PLUS when you purchase TCF Email Miner we will show you the EXACT SAME METHODS we use to convert prospects from TCF Email Miner into fully opted-in subscribers and customers. If TCF Email Miner gave you a Hundred Thousand Leads then think about how much you will make each month if you convert even just 10% of those into full subscribers... YES $10,000 a month in revenues! Even if you convert just 5% then you can potentially create revenues of $5000 a month. We will show you the EXACT SAME METHODS that we use! Don't Worry... We've Got That Covered! With TCF Email Miner we give you lots of great bonuses to help you with fantastic information about Email Marketing and List Building PLUS our YouTube Channel is packed with all the latest strategies. See our great BONUSES below which include THREE fantastic books worth $150 that will help any newbie get started with Email Marketing and List Building. These books are packed full of fantastic information so newbie or not you are going to get tremendous value from them. The knowledge in these books will help you maximise the results you get with the leads you get from TCF Email Miner. With Lots of Powerful Features! Search Algorithm For Maximum Results! Using our own propitiatory email search technology - version 2.2, we maximise the emails you can find and export with TCF Email Miner. We return free emails that have been published into the public domain, so these are genuine contact email addresses. We are constantly working to improve our search algorithms. We don't deep mine into websites or pull back emails from behind password walls so we are not in breach of any privacy laws. However please check out our advise on how to use the email addresses safety and effectively. 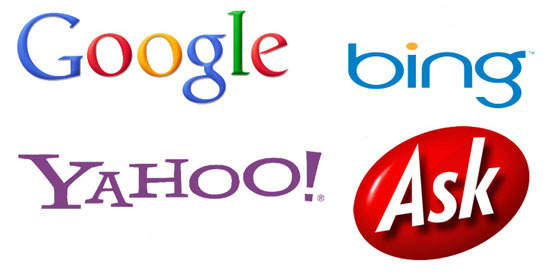 Google, Yahoo, Bing, Ask For Maximum Results! TCF Email Miner uses Google, Yahoo, Bing and Ask to maximise the email results you get. We've tested with many search engines but found with these four you will easily get 99% of the potential email leads from your searches. TCF Email Miner Geo-Targeting technology allows you to not only search the world but also to search down to a country level, so you can target from anyone of over 200+ countries we support and get specific results back from just those countries. So Why Not Give TCF Email Miner a Road-Test? You can try TCF Email Miner free of charge. The Trial version is fully functional, except for one thing, the save and export functions are restricted. So why not give TCF Email Miner a road-test today so you can see just how this neat and powerful software works and we are sure you will be back for your full version. Windows 7, Windows 8.1 (Desktop Mode Only) and Windows 10. It can run on Apple Macs via Windows emulators but we won't provide support on Apple platforms. I was really impressed that it can collect Thousands of emails and verify them too. It's very good and a great piece of software. This is an amazing software whatever the price is. It's a product that is worth getting and its a product I highly recommend. With this System you can dominate any opportunity, this is a world class system at an incredible price. TCF Email Miner is a tool you are looking for and I hope you enjoy it as much as I have. So Can You See How Much Value There Is In Creating TARGETED Lists of Email Addresses of Potential Leads? If you search for the right business keywords then you can get a never ending GOLD mine of email addresses from TCF Email Miner. Why build an email list the hard way when you can do it the EASY way with this amazing growth hacking software? For our Power Users who want a lot of email addresses fast we offer our 20 license Power User package. Our most popular package is our 5 license package but we also offer a 1 license package for users on a tight budget. Whatever you're budget and requirements are we have a package to suit. So grab your copy for a one-off price ... for LIFETIME ACCESS! If you’ve ever asked for information online about a product or service, or signed up for an e-list or group membership on the Internet, and received a nearly instantaneous response in your e-mail inbox, an auto responder program was responsible for delivering the reply. To make money with auto responders, you need a product. Most of the time, the product you’re selling is information: an e-book, print book, e-course, e-zine or newsletter, CD, or downloadable audio program. Now that you’ve chosen a topic, it’s time to research your market. If the word “research” makes you break out in a sweat and experience flashbacks to all that time you spent in high school poring over books, scribbling out notes and wondering why teachers delight in torturing their students, don’t worry—it’s easier than you think. 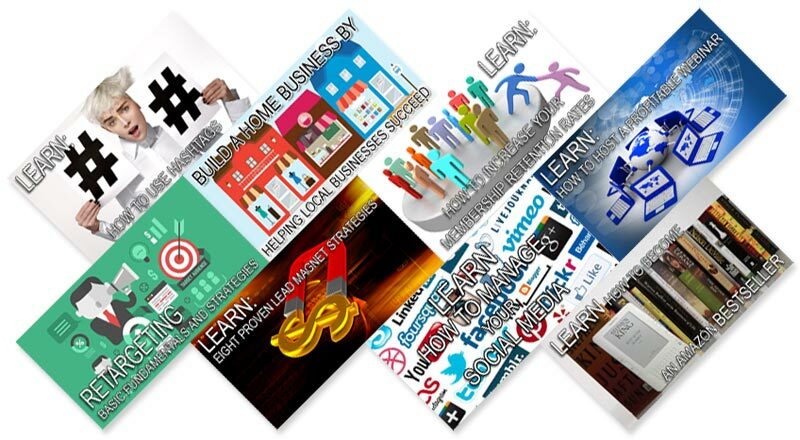 Your content is your product: your book, e-book, e-course, CD or downloadable audio program. This is the information people will pay you to receive. Creating a great auto responder message series is the key to making serious money on the internet. Studies have proven that most consumers buy only after repeated exposure to a product. Now that you have your topic, you’ve researched your market, and you have composed a fabulous series of autoresponder messages, you’re ready to put together the other crucial component of your successful autoresponder campaign: your web site. Let’s review what an opt-in list is: a collection of e-mail addresses you get from people who are interested in your product, and request to join your autoresponder list. This means your autoresponder messages will not be considered spam, and the reputation of your business will help build consumer confidence and increase sales. Once you have your product, your autoresponder message series, your web site, and all your accounts in place, it’s time for the fun part: driving traffic to your web site and watching your internet money machine in action. Online marketing may have developed a sudden surge these past few years, but many in the know how have felt its rise even from way then. As more internet based businesses are put up, the need to develop new marketing skills and knowledge based on this new medium have arisen. Every online business provides great service to generate satisfaction among their customers. As each and every customer receives satisfaction over their products or the services they get, there is a great chance that they will become a return customer and buy again. Are you fed up of reading countless success stories of people creating a small fortune with opt-in lists and do you want to find out how you can have one of your own. Email Marketing A-Z shares the secrets of getting your emails open and building a powerful list. Many websites and online businesses have resorted to sending promotional materials to people who have subscribed to them in an effort to boost their sales or traffic. Providing a newsletter for your opt-in list subscribers provides many benefits in terms of driving traffic into your site as well as boosting the sales and profits of your site and company. When you decide to have an opt-in list, it is not just a matter of sending your subscribers your promotional newsletters or catalogues. There are many things to consider in avoiding many complications. I’m going to cut out the fluff and filler and get right to the heart of the matter. You want and need to build a mailing list of targeted prospects. Your squeeze page is where the magic happens. It is where visitors are converted into subscribers – giving you the opportunity to transform subscribers into customers and repeat buyers. Once you have your incentive offer, auto responder account and squeeze page ready to go, the next step is to set up your entire back-end system. You’re now at the point where you are ready to begin driving targeted traffic to your squeeze page, in order to begin building your mailing list. Exploit Rapid-Fire List Building Strategies that will shoot you straight into the heart of your niche market and increase your earnings and Email List size practically overnight! Feeder sites are communities and networks that allow you to create individual websites or pages that can funnel traffic into your website, quickly and easily. There are many different ways to monetize your email lists, including affiliate marketing, promoting your own products, reselling private label or resale rights content, and by funnelling traffic through Adsense based sites or CPA offers. When it comes to creating winning email campaigns, just as you tested your squeeze page, you must also split test and monitor the performance of your email broadcasts. 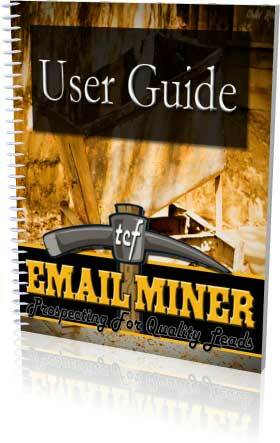 You'll Also Get The TCF Email Miner User Guide! The TCF Email Miner User Guide will give you Step-By-Step instructions on how to make the most of the Miner's features and useful tips on what to do and what not to do when using your emails. 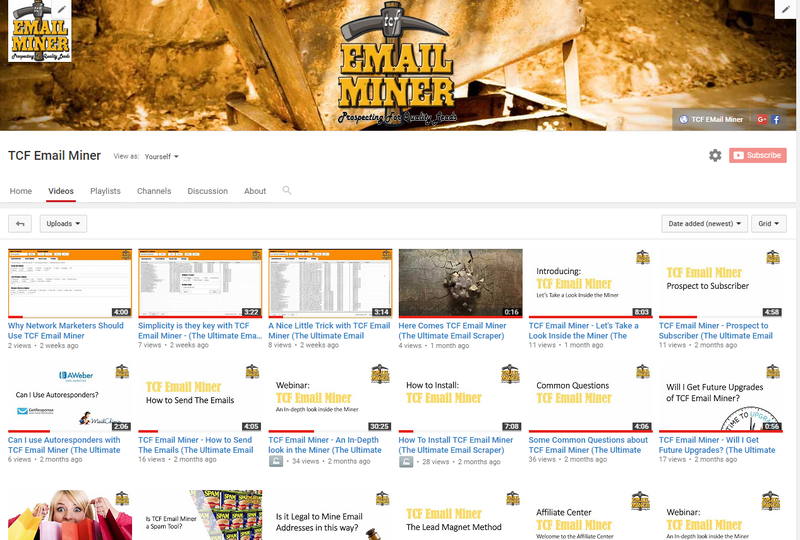 The TCF Email Miner YouTube Channel is packed full of lots and lots of useful videos and we are adding to them all the time. You can get your questions answered and we show you all the very same techniques we use to convert prospects from TCF Email Miner into full subscribers and customers. You can check out all our latest strategies and hints and tips! Targeted Leads you can start extracting within the next Hour, so why Wait? No. of License(s)/Installs: 100 Installs !!! * If you reside within the EU local sales tax will be applied. on clicking one of the buy buttons above. We want you to be 100% satisfied with your purchase of the TCF Email Miner software. With that said, if after using the software you feel it does not do or have every feature we have demonstrated, just send a refund request to our support and we’ll issue you a prompt and courteous refund. Any Questions on TCF Email Miner? Copyright © 2019 The Covert Formula Ltd (trading as TCF Software). All Rights Reserved.